If you don't want to fuss with sticking your hand in your tank, getting burned or dealing with broken heaters, the Hydor In Line External Heater is a very promising unit that neatly hides away under your aquarium cabinet along side your canister filter. Sticking electrical heaters inside your tank can take away from the beauty of your aquarium as well as be potentially dangerous. 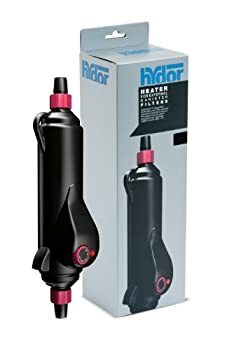 Hydor solves both these problems by making an inline aquarium heater that connects to your external canister filter. At 300 watts the inline heater connects via a 5/8" hose connection to an external canister filter. Water is pulled from your aquarium and first filtered by your canister filter to remove any debris. After passing through your biological and or mechanical filter media, water is forced out by the canister filter motor and exits via a hose outlet. The Hydor In Line External Heater connects to your canister filter outlet hose, heating water as it passes through. Ultimately your aquarium water is safely replaced back into your fish tank warm and clean.